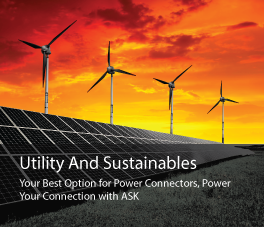 ASK has been a long-term supplier to the fast-growing utility and sustainable industry, where we’ve been leaders not only in what we provide, but how we deliver it. For more than 25 years, we’ve proven ourselves to be a trusted private-label supplier to the largest private and public companies in the industry, as they provide post-catastrophe and ongoing service in some of the most high-profile environments you’ll find. We were among the first to outfit American-made turbines with American-made connectors. The custom in-house engineering and manufacturing services that give us prototype capabilities allowed us to design WIND Narrow Tang DLO (Diesel Locomotive Cable) Connectors for the country’s largest turbine manufacturer. And we continue to supply the majority of wind turbine connectors to companies whose household names are synonymous with quality, while still meeting our customers’ emergency, storm and small-quantity needs. Our products are tested to exceed ANSI C119.4 and UL 486A and B standards – download our 2,500-part online catalog to see all of what we offer. Not sure what you need? Visit our helpful product configurator today. See why we’re your best connector option. Contact us today.